Hello freebie-lovers! The Freebielicious ladies know how much teachers appreciate good freebies, but we know that teachers are downright OBSESSED with new school supplies. 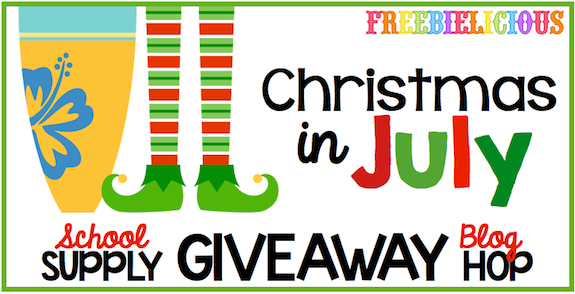 In honor of the back to school season that is quickly approaching, Freebielicious is hosting a MEGA Christmas in July Giveaway. We know that lots of people are giving away product freebies during this time (which are great! ), but we wanted to do something different just for you! We have selected our very favorite school supplies and each blogger is hosting a mini-giveaway for a chance to win our favorite supply. I can't start my year off without refilling my "smelly" container with lots of yummy, new flavors, so this Christmas in July, one lucky MMMB follower will win their very own Smelly Starter Collection. Don't know what smellies are? Quickly, they are smelly chapsticks (do you know how many choices are out there these days?) that you swipe on childrens' hands as positive reinforcement. They LOVE it, it costs next to nothing, and the variety allows it to continuously be "new" as a reward. I use it as a motivator for kiddos to get ready quickly during dismissal time for the most part, BUT, you can use it because a child wrote a descriptive sentence, because a child models great behavior OR FOR ANYTHING....kids of all ages LOVE THIS. Click here if you want more than just my abbreviated version of what a smelly can do for you and your classroom. Click here if you still want to know more AND if you want a freebie to make your own collection for you and your teacher friends. Use the Rafflecopter for your chance to win a Smelly Collection in a storage container for your classroom! In addition to the School Supply Giveaway Blog Hop, we also have a few amazing grand prizes over on the Freebielicious blog. First of all, you could win an entire set of ALL the favorite school supplies of the Freebielicious bloggers! 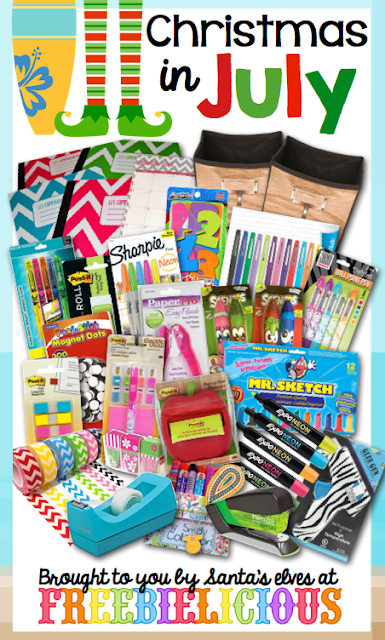 We also have a special Grand Prize of Back to School goodies from Santa's Helpers (aka our sponsors). You won't BELIEVE the amazing lineup of prizes in this collection. 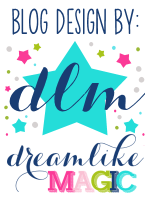 Follow the giveaway hop and enter to win a special treat from all of Santa's blogging elves! Your next stop on the Christmas hop is Live Love Laugh in Kindergarten . 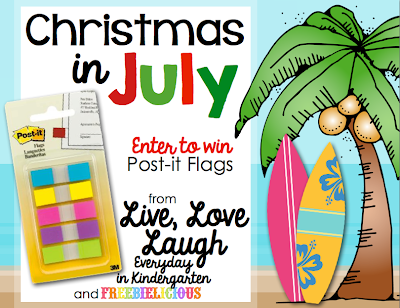 Click on the image below for your chance to win a set of Post It Flags! 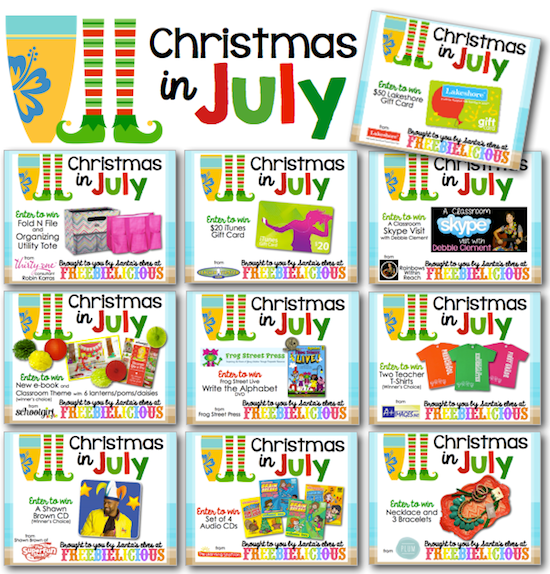 Merry Christmas in July from Santa's elves at Freebielicious! Isn't this the best giveaway EVER? I don't know how to figure out what number follower I am on TPT... I have been following for a long time.... can you tell me how to figure it out..thanks! It makes learning easy and fun for young children, making it the best educational app for kids. wow.. they're so cute.. love it..